・NEW! 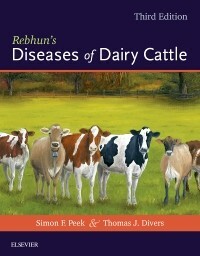 All-new chapter covering diseases specific to or common in the dairy bull offers valuable new content that makes this the most comprehensive resource for veterinary students and practitioners. ・NEW! A companion website, hosted by Cornell University with more than 60 neurologic, ultrasound, and endoscopic case study videos, illustrates key concepts discussed throughout the book and brings to life a variety of techniques that are more easily visualized than described in print. ・UPDATED! Expanded coverage of herd health features diseases of individual cows, as well as problems affecting entire herds, that challenge today's large animal veterinarians. ・NEW! Emphasis on herd health addresses the dairy industry's increased concern over population medicine. ・UPDATED! Revised drug usage recommendations and legal considerations present the most current information in these critical areas to help you prevent dangerous or costly errors. ・Practical overviews for procedures such as blood transfusion, abdominal paracentesis, and ECG give you reliable support for some of the most common procedures in bovine care. ・A logical and user-friendly body systems organization makes diagnosis easier and more effective by isolating system-specific diseases and conditions. ・Additional public health/safety considerations identify diseases that pose a substantial public threat and detail special measures for related care of dairy cattle. ・Addresses the latest treatment innovations, including: antibiotic residue testing, care of individual metabolic disease, troubleshooting, and much more. ・Expanded, up-to-date coverage of public health/food safety considerations for practitioners helps to prevent dangerous and costly errors. ・Current legal and practical considerations for extra label medications are outlined, and all recommendations for drug usage have been revised according to federal guideline changes, to help ensure that you are familiar with the latest evidence-based guidelines.